Here’s the latest project from Lucas Silva, the man who’s done more than anyone to get Colombian champeta music in front of the masses. This time he’s engaged Barcelona-based DJ Panko to remix nine Silva-produced tracks. Panko is the long-time turntablist for the legendary Ojos De Brujo; he has a keen ear for champeta so I’m assuming he was already a big fan. He takes each of these tracks in totally different directions without losing the Afro-Colombian core of any of them. 2 is speed cumbia enlivened with natural percussion, turntable scratching and what sounds like Rahsaan Roland Kirk’s flute part from the Austin Powers theme song. 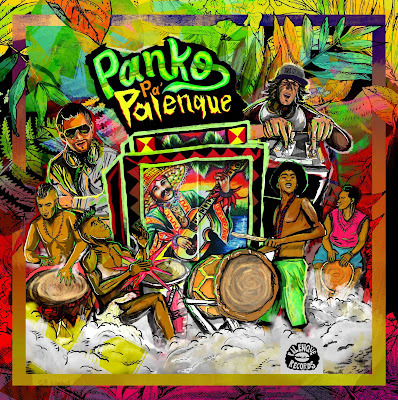 3 starts with a Colombian pico (sound system) MC, brings in a mariachi horn section, then veers sharply to the left with a Balkan Beat Box sample. 9 is Panko’s second take on Batata’s champeta classic (he remixes it on 7 as well) that already has a definitive remix (by Peru’s Novalima); Panko spices it up with gaita flute and a march-like rhythm that’s almost Brazilian batucada. 4 uses a light touch on a song from Silva’s Colombiafrica project, subtly accenting the tracks’ dancefloor potential. Just what I want in a remix session.